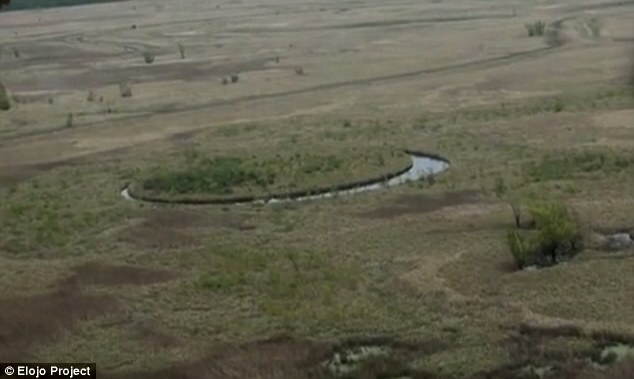 A strange and almost perfect circular island sits near the northeastern edge of Argentina, which is said to float on its own axis in the middle of a swampy marsh. Called 'The Eye', this mysterious land is surrounded by a tiny channel of clear water and some believe it is camouflage for a massive alien base that lays quietly beneath the surface. Now, a team of researchers and filmmakers have opened a Kickstarter campaign to help fund their investigation of these bizarre claims, with the hopes of uncovering the mystery of this remote island once and for all. 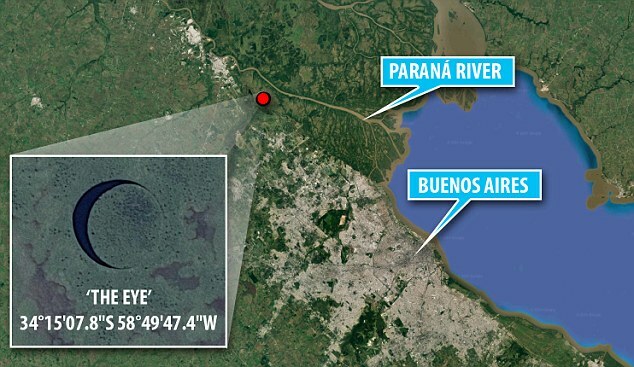 'We have discovered a mysterious island near the Parana river, which, intriguingly, moves and rotates on its own axis,' Richard Petroni, a hydraulic and civil engineer from New York who is involved in the project, said in a press release. Petroni has teamed up with Argentine film director & producer Sergio Neuspillerm, who made the discovery, as well as tech expert and founder of a telecommunications company, Pablo Martinez,for this journey. 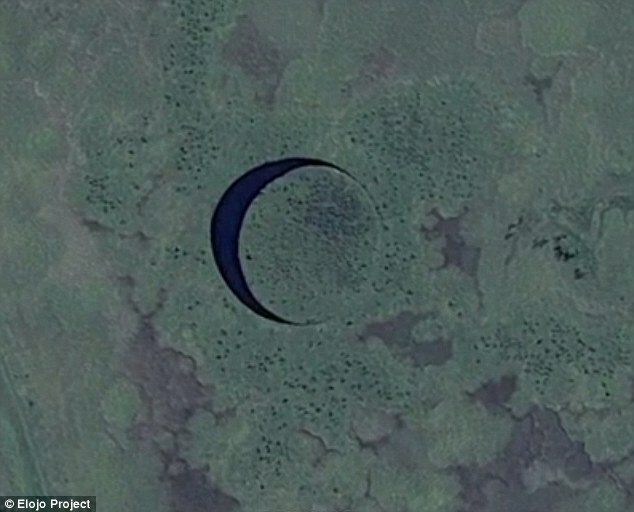 'The Eye' can be found on Google Maps using the coordinates: 34°15'07.8'S 58°49'47.4"W.
It is located in the Parana Delta between the cities of Campana and Zarate in Buenos Aires, Argentina. The island was first spotted by the film crew six months ago when they were looking for a place to shoot a film covering other paranormal occurrences, such as ghost and alien sightings, in the area. After the team plugged in the specific coordinates and saw the mysterious spherical landmass on the computer screen, they knew they had to see it with their own eyes. 'When locating this reference in the map we discovered something unexpected that left the film project in the background, we call it 'The Eye',' said Neuspillerm in a video. 'Both circles [the water and land] are so perfect that it is hard to believe that this is a natural formation'. 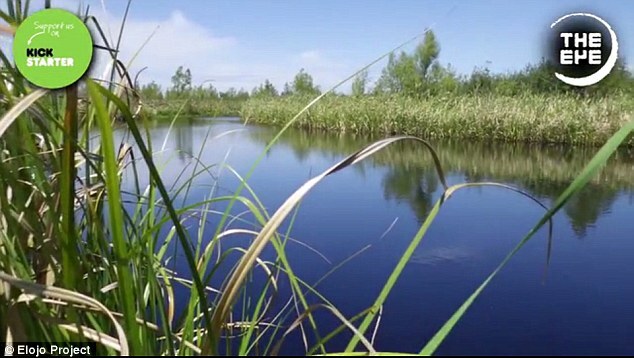 The team trekked through the marshy surroundings, trying to find an entry point, but were unable to make their way to the island. Finally, in their second attempt and after eight hours of hiking, they stumbled upon 'The Eye'. 'The place was amazing and extremely strange,' said Neuspillerm. I wish I had ten grand, that gets you on the first expedition. Any thoughts on what this is? In all seriousness, I do not believe that this would be a natural phenomenon, given the perfectly circular shape of both the island and the surrounding water channel. But still, that does not exclude that it could have been created — whether deliberately or as an unintended byproduct — by human activity. One way of excluding that possibility would be to contact any nearby population groups — and maybe the Argentinian government, as they may have records — to hear whether they remember any specific geological or industrial activity in the vicinity, or, conversely, any significant paranormal activity. I also surmise that the island is still fairly new, given the perfectly smooth and circular shapes of both the island and the "lake" it sits on. If it had been very old already, then there would have been a sufficient amount of erosion to change the circumference of the island, not to mention of the "lake". It sure boggles the mind. I don't think it's natural either, it's too out of place in its surroundings. Rodrigo Artana, another experiencer, told a story in which a perfectly shaped circular light followed him while he was coming home after a late dinner. “What was striking was the fact that it was a perfect circle,” he said. Furthermore, it disappeared as suddenly and quietly as it had appeared in the first place. Some of his friends believed him, others did not, but he felt it was a positive experience overall as it was a connection with the unknown. Other reports include cars stalling on the highway near the area which have been branded “dead zones” or “ghost zones” by locals, balls of light descending from the sky, and other mysterious objects that have been seen moving in the general direction of the circle. You would think so wouldn't you but nope, the earliest image for those coordinates is from July 2003 and the eye was there then, as seen below, in the video at the 1:19 mark (or on Google Earth). So it's been there at least 13 years, way too long for it to stay intact like that and not grown over. I watched the video here and the slightly longer one on the site. They show the first Google image of it and it looks a little off in shape. The more recent images are rounder. A hard bottom could be rock. Perhaps there is an aquifer that's welling up, providing the clear, cold water. Don't know about the circular shape. It's dynamic. The center of the island seems to have plenty of greenery. I like the Kickstarter idea. Keep it open and visible. In addition there could be Inner Earth civilizations/entities nearby, underneath. Yes. We even have declassified FBI documents from the time that indicate that the FBI was monitoring Nazis escaping from Europe and arriving in Argentina. And they also declassified some files not long ago showing that they had reports of Hitler escaping Europe and landing by a pair of submarines in Argentina, and traveling into the interior from there. Joseph Farrell talks about a lot of other documentation of this happening, and Nazis being active in South America in general after WW2. At first I thought this may have been the result of an underground or space-based weapons test, but then when they say it rotates it makes me think it's some kind of enormous, camouflaged sensor built into the ground. I have a hard time imagining anybody else investing in building such a thing unless it was military in nature. But who knows. We'll see in time I guess. Yes, but what I meant was that it clearly hasn't been there for like 1'000 years. Because that would really significantly alter its outline in a perceivable manner — we have to keep in mind that this is not a small patch of land of some 5 meters in diameter, so in order to alter the circumference of something that size by way of natural erosion, it would have to be several hundreds if not thousands of years old. Unless of course it truly is of extraterrestrial origins — and according to the information you provided in response to my previous post, it's beginning to look like that — because then there might be some forcefield at play which protects the island from any erosive influences. It either way warrants a proper independent investigation, and preferably with some of the bozos from the established scientific academia standing by in order to witness the tests, so that they can't go and debunk it all in the mainstream media afterwards. Yeah sorry about the misunderstanding, I was tired and had a daft moment and wasn't even talking about erosion, which looks about right when comparing the first and more recent images. I was thinking of how wild and untamed the nature of that land is and how perfectly that whole form has been preserved over the past 13 years. I'm not as certain about my point this morning though, there may be enough factors to make sense of it, like the size of the whole form and the movement of the island, still pretty strange though. LOL, if it was something awesome they'd probably still try debunk it anyway. I've been looking at a mystery near The Eye. There's a ship graveyard not far away and how they got there is a mystery, see video below for more details (duration 2:50). Looking to confirm what I'm seeing here, at the 1:48 mark you can see the name of one of the ships, I'm seeing, "DONA GREGORIA", is that correct? At the 1:50 mark you can see the name of another much larger ship. I can't see what it says, it's not so clear but perhaps it will make sense to someone who is familiar with Spanish, can anyone read what that says? I don't know much about ships but I'm thinking there are records for all the registered ship names, do you know how far back they go and how thorough they are? Could I narrow down the time frame of when these ships were in operation by the names? I'm thinking if the language has changed, like english has over time, I could get an idea of when these ships were operating. It would be interesting to see if any historical records of these ships exist and see what became of them, if possible. I have looked up Dona Gregoria but I'm not getting very far with not being able to read Spanish. Any information would be appreciated. I think it's old, perhaps about two thousand years old. It reminds me of the ancient technology being discovered in the Bosnian pyramid, elegant, utilising nature, brilliant. The circle and the water is very powerful energetically and there is testimony of lights in the sky in that area. Here's a short playlist of testimony, each video is about two minutes long. It would make a lot of sense that it's UFO related but I don't think there would be a base underneath, if it is connected to UFOs then it seems too elegant to be concealing a base. It was only a matter of time before it would be discovered and that sort of degree of technology indicates races who would hide bases more effectively, if they needed any at all. I say it's old because, in the case of it being ET technology, it likely started out as a circle cut out of the land, with no space between the island and the outer circle and the gap seen today would be from erosion. I'm thinking it's more like some sort of structure that would be used to facilitate travel to and from other dimensions and it would still function effectively with the erosion. This would explain the movement of the island, some sort of vortex energy could cause it to spin and would also explain the other paranormal activity in the area. All I'm seeing is "DONA GREGORIA" in two places. It looks like there's a second ship but I don't see any name on it. They should be registered somewhere with the Argentine government. Depending on what kind of boat it is and what it was used for, there are different kinds of records, but they are often pretty detailed because the things ships do are usually regulated by the government (trade, fishing, military, etc.). It may or may not be public information. I'm not an expert on boats but these look fairly modern and are made of metal. I would guess they are WW2 era or later. Someone more familiar with boats would know better. The people in the video are saying that the boats are made of steel, which makes sense. If they were American ships I'd say they were WW2 era by the look of them. They look to me like they could be military ships. I have a feeling that no private enterprise would go out of their way to abandon private ships in the middle of nowhere. You could at least scrap them for money. Doña Gregoria means "Miss Gregoria" and probably refers to doña Gregoria Matorras, an Argentine historical figure known as the "Grandmother of the Country." Militaries tend to name ships after historical figures. Last edited by bsbray, 12th September 2016 at 05:43. Ah, I mistook the name at 1:50 to be from a separate ship because it wasn't all in upper case like on the side. I see a much clearer image of that at 2:10 where I can see it reads Dona GREGORIA so yes, I see now that we only see the name of one ship. Them being military makes a lot of sense, it also solves the problem of how they got there. They mention that it would be too big of an endeavour to tow them there, but the military would have the resources. Seems easy enough to check and not so much of a mystery after all. Even if it is the military behind everything in the area it still seems pretty damned mysterious to me. With all the Nazi refugees who fled to Argentina, and the dictatorship they supported there, and all the talk of high-tech Nazi saucers and all that, it's hard to tell what the hell that thing might be. I was referring to the presence of the ships only, not the whole area. I heard a recent report about a frozen river which had a floating, spinning disc of ice in it. A piece breaks off and then the motion and current cause it to spin, the edges smooth out and it becomes a circle. Perhaps a similar kind of process happened with a piece of land.